He was sent out by Rasulullah SAW to assassinate Aswad Ansi, who had claimed prophethood in Yemen. In reference to this, Rasulullah SAW was reported as saying, "He was killed by the virtuous man Fayruz b. al-Daylami." Fairuz died during the caliphate of Saidina Uthman RA. 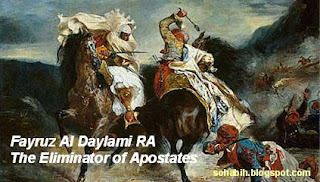 For Illustration Only: Fayruz Al Daylami RA Fighting the Apostates. Most Muslims know the famous Sahabi named Salman Al-Farsi RA. However, many are not aware that there were more than just one Persian Sahabi. Apart from Salman Al-Farsi RA we have: FAIRUZ AL-DAYLAMI (originally from north Iran) (also known as “Abu Al-Dhahhak” or “Abu Abdul-Rahman”): A Persian from the descendants of Persian Zoroastrians. He belonged to the descendants (abna) of Persians that had been sent by Khusraw (Kisra) Anooshiravan to Yemen, conquered it, and drove out the Abyssinians (the south of Yemen was basically occupied and ruled by Persians). He was sent out by Rasulullah (صل الله عليه و على آله و سلم) to assassinate Aswad Ansi, who had claimed prophet hood in Yemen. In reference to this, the Prophet was reported as saying, “He was killed by the virtuous man Fayruz b. al-Daylami رضي الله عنهما,” Fayruz رضي الله عنهما), died during the caliphate of Saidina Othman Ibn ‘Affan رضي الله عنهما), may Allah be pleased with them all. A Persian Sahabi, who was from The foremost, the first of the emigrants, a Badri, one of the first Sahabah. He accepted Islam before Salman Al-Farsi رضي الله عنهما, for Salman رضي الله عنهما), accepted Islam in Madinah (did not witness the Makkan period at all). He was a highly respected and valued Muslim (among his fellow Muslims), who died while fighting against the forces of Musaylimah during the Wars of Apostasy. “Learn the Qur’an from four persons: Abd-Allah ibn Mas’ud (رضي الله عنهما) Salem the Mawla of Hudhayfah, Ubayy ibn Kab (رضي الله عنهما) and Muadh ibn Jabal (رضي الله عنهما) ” Abdullah Ibn Omar (رضي الله عنهما) the son of Saidina Omar Ibn Al-Khattab (رضي الله عنهما), one of the major companions of the Messenger of Allah (صل الله عليه و على آله و سلم) said the following about Salem: . The close friend & servant of Rasulullah (صل الله عليه و على آله و سلم) (he used to be the servant of Umm Salamah). Also from the ‘Abna Fares’. He had many nicknames, one is “Safinah” (the Ship), which was givin to him by Rasulullah (صل الله عليه و على آله و سلم) peace be upon him (he is referred normally by that name in Ahadith). He was of Persian descent, and was married to a Himyarite. He is the father of the two famous Yemeni-Persian Tabi’is Wahb ibn Munabbih and Hammam ibn Munabbih.He came from Herat (today in Afghanistan), Khorasan in Persia to Yemen. It is likely that he met Rasulullah (صل الله عليه و سلم) since he is the father of two early Tabi’is, yet we haven’t found definitive evidence for that in Arabic language. When Rasulullah SAW, returned to Madinah from the Farewell Pilgrimage in the tenth year later the Hijrah, he plunged unwell, News of his illness spread promptly as prolonged as the Arabian peninsula. Sincere Muslims everywhere were greatly saddened by the news but for others it was a time to uncover hidden hopes and ambitions and divulge their real views to Islam and the noble Prophet. 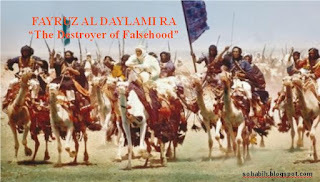 In al-Yamamah, Musaylamah the Imposter renounced Islam. So too did Tulayhah al-Asadi in the land of the Asad. And in the Yemen, al-Aswad al-Ansi also became an apostate. More than that, these three imposters contended that they were prophets sent to their respective peoples just as Rasulullah SAW was sent to the Quraish. Al-Aswad al-Ansi was a soothsayer any person who prepared magic arts. But he was no peripheral magician or fortuneteller any person who dabbled in his evil arts in obscurity. He was forceful and influential and possessed a unusual vitality of speech that mesmerized the hearts of his listeners and appealed the heads of the masses with his fake claims. With his affluence and vitality he treated to attract not just the masses but population of relative standing as well. When he arose in the past population he usually wore a mask in lead to encircle himself with an sky of surprise, awe and reverence. In the Yemen at that time, a phase of the population any person who had much prestige and consequence were the "Abna". They were the scions of Persian fathers any person who administered Yemen as component of the Sasanian Empire. Their mothers were provincial Arabs. Fayruz al-Daylami RA was one of these Yemeni Abna. At the time of the attainment of Islam, the bulk forceful of the Abna was Badhan any person who administered Yemen on behalf of the Khusra of Persia. When Badban became argued of the certainty of Rasulullah SAW and the Divine nature of his mission he renounced his allegiance to the Khusra and recognized Islam. His population pursued him in tiffs. The Prophet confirmed him in his dominion and he administered the Yemen until his death before long in the past the attainment of al-Aswad al-Ansi. Al-Aswad's tribe, the Banu Mudh-hij, were the first to respond positively to his contentions to prophethood. With this tribal compel he mounted a raid on San'a. He slaughtered the governor, Shahr the son of Badhan and took his wife to himself. From San'a he raided o ther regions. Through his swift and startling bangs, a vast region from Hadramawt to at-Taif and from al-Ahsa to Aden came below his influence. What alleviated al-Aswad in deceiving the population and drawing them to him was his guile and cunning which knew no bounds. To his buff he alleged that an angel visited him, uncovered discoveries to him and gave him intelligence of population and their is noteworthy . What sanctioned him to arise to endure out these contentions were the spies he enlisted and despatched everywhere, to bring him news of population and their circumstances, their enigmas and their difficulties, their hopes and their fears. Reports were brought behind in secrecy to him and after he greeted anyone, particularly those in deficiency, he could give the impression that he had prior familiarity of their requires and problems. In this way he astounded population and confounded their thoughts. He paid for a many pursuing and his mission spread like wildfire. When news of al-Aswad's apostasy and his achievements as prolonged as the Yemen came Rasulullah SAW, he dispatched come seal ten of Iris companions with letters to those of his companions in the Yemen whom he discerned he could trust. "I and those of the Abna any person who were with me never for one moment had any distrust come seal the religion of Allah SWT. No trust in the enemy of Allah SWT entered the heart of any one of us. (In fact) we waited for opportunities to receive retain of al-Aswad and remove him by any means. When we received the letters from Rasulullah SAW, we discerned bolstered in our mutual deduce and each one motivated to do what he could Because of his extensive success, pride and vanity took retain of al-Aswad al-Ansi. He vaunted to the commander of his army, Qays ibn Abd Yaghuth, expression how forceful he was. His view and relationship towards his commander modified so much so that Qays discerned that he was not safe from his violence and oppression. My cousin, Dadhawayh, and I went to Qays and informed him of what Rasulullah SAW, had conveyed us and we invited him to "make lunch" out of the man (al-Aswad) in the past he could "make supper" out of him. He was receptive to our proposal and supposed us as a Godsend. He uncovered to us numerous of the enigmas of al-Aswad. The three of us vowed to confront the apostate from within (his castle) where our other brothers would confront him from outside the castle. 'O cousin, you know what harm and evil this man has visited upon you and us. He has slaughtered your husband and dishonored the women of your people. He has massacred their husbands and wrested political command from their hands. 'This is a letter from Rasulullah SAW to us in individual and to the population of Yemen in complete in which he asks us to left an end to this fitnah. Would you assist us in this matter?' 'On what can I assist you? she asked. 'On his expulsion...' I said. 'Rather on his assassination,' she suggested. 'By Allah, I had none then in mind,' I said, 'but I was afraid to recommend this to you.' 'By Him Who has sent Rasulullah with the Truth as a bringer or' good tidings and as a warner, I have not doubted in my religion for a moment. Allah SWT has not written a man more detestable to me than the devil (al-Aswad). By Allah , from the time I saw him, I have simply known him to be a corrupt and sinful person any person who does not promote any certainty and does not finish from committing any abominable deed.' "How can we go come seal getting rid of him?' I asked. 'He is well-guarded and protected. There is not a location in his mansion which is not encircled by guards. There is one contravened down and left room though which opens out into free-spoken land. In the after dark during the first third of the night time, go there. You will pinpoint interior weapons and a light. You will pinpoint me waiting for you...' she said. 'But bringing through to a room in a mansion such as this is no easy task. Someone might surpass and warning the guards and that will be the end of us' I said. 'You are not far from the truth. But I have a suggestion.' 'What is it?' I asked. 'Send a man tomorrow whom you trust as one of the workers. I shall tell him to generate an possibility in the room from the interior so that it ought be easy to enter.' 'That's a radiant signal you have,' I said. I afterward withdrew her and conveyed the couple of others what we had decided and they gave their blessings to the plan. We withdrew straightaway to receive ourselves prepared. We informed a decide assembly of believers any person who were joining us to prepare themselves and gave them the password (to indication the time they could fume the castle). 'Don't worry. You can go. The prophet of God is receiving revelation,' she said, and they left. We waited in the mansion until the contravene of dawn. Then I stood on a wall of the mansion and shouted: 'Allahu Akbar! Allahu Akbar!' and went on with the adhan until I reached': 'Ashhadu anna Muhammadur Rasulullah ! (Then I added) 'Wa ashhadu anna al Aswad al-Ansi kadh-dhab ! I testify that al-Aswad is an imposter. 'That was the password, Muslims afterward converged on the mansion from every direction. The guards took fear after they perceived the adhan and were confronted by the Muslims yelling Allahu Akbar. By sunrise, the mission was accomplished. When it was full candle, we sent a letter to Rasulullah SAW compensating him the good news of the death of Allah's enemy. "I have perceived that you are busy eating white bread and honey (meaning no distrust that he was directing an easy life). When this my letter comes you, arrive at me with the blessings of Allah so that you may campaign in the road of Allah." Fayruz RA did as he was commanded. He went to Madinah and explored an audience with Saidina Umar Al Khattan RA. Saidina Umar RA bestowed him permission. Evidently there was a crowd waiting to suppose Umar RA and a Quraish youth compressed Fayruz RA. Fayruz stood higher his hand and beat the Quraish youth on the nose. The youth went to Umar any person who asked: "Who did that to you?" "Fayruz. He is at the door," said the youth. Fayruz Al Daylami RA entered and Umar asked: "What is this, O Fayruz?" "O Amir al-Muminin," said Fayruz. "You wrote to me. You didn't write to him. You gave me approval to enter and you didn't give him permission. He trusted to enter in my turn in the past me. Then I did what you have been told." "Al-Qisas," pronounced Umar RA in punishment, meaning that Fayruz RA had to receive the same blow from the youth in retaliation. 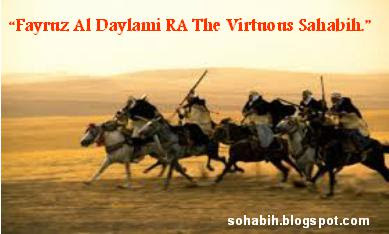 For Illustration Only: Fayruz Al Daylami RA " The Virtuous"
"Do you suppose yourself taking retribution on him later you have perceived this from Rasulullah SAW ?" "I forgive him," said the youth, "after you have conveyed me this from Rasulullah." "Do you think," said Fayruz to Umar, "that my departure from what I have done is a confession to him and that his forgiveness is not given below duress?" "Yes," replied Saidina Umar RA and Fayruz RA afterward declared: "I testily to you that my sword, my horse and thirty thousand of my currency is a gift to him." "Your forgiveness has compensated off, O brother Quraish and you have become rich," said Saidina Umar RA no distrust impressed by the sense of remorse and the spontaneous willingness of Fayruz Al Daylami the righteous. Make a Zabib from it (dry grapes). Fairuz Al Daylami asked Rasulullah SAW:, how are we going to make the zabib? Rasulullah SAW said: : Soak it in the water during day time , than drink it during the night, and soak in the night than you may drink it in the morning. Fairuz Al Daylami RA asked further: O Rasul of Allah we are people that you know and we lived within the people that you know, so who is our Wali?. Rasulullah SAW said:: "Allah and His Rasul he said and that sufficient for us and Ridho with it"
(Similar to the above) .[HR. Ahmad No.17345]. (Similar to the above Hadith) . [HR. Ahmad No.17349]. (Similar with the above hadith)[HR. Ahmad No.17350]. قَالَ أَبو عَاصِمٍ: عَنْ عَبد الْحَمِيدِ، عَنْ يَزِيد بْنِ أَبي حَبِيب، عَنْ مَرثَد بْنِ عَبد اللهِ، عَنِ ابْنِ الدَّيلَمِيّ؛ أَنَّهُ سَأَلَ النَّبيَّ صَلى اللَّهُ عَلَيه وسَلم: أَنا مِنكَ بَعِيدٌ، وأَشرَبُ شَرابًا مِن قَمحٍ، فَقال: أَيُسكِرُ؟ قلتُ: نَعَم، قَالَ: لاَ تَشرَبُوا مُسكِرًا، فَأَعادَ ثَلاثًا، قَالَ: كُلُّ مُسكِرٍ حَرامٌ..